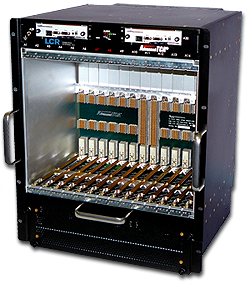 The Gemini is a rugged, 14-Slot AdvancedTCA chassis designed for airborne, shipboard and ground mobile equipment. Designed in accordance with PICMG 3.0, this chassis is sturdy, efficient, and designed to support your most environmentally demanding mission-critical military applications. If you would like more information about this product, contact our Sales Representative near you, or contact LCR Embedded Systems directly! Learn how you can take advantage of our experience when it comes to bringing the benefits of AdvancedTCA to the most demanding deployment environments -- shipboard, airborne, or ground mobile!